One of the most prevalent aspects of human genes is that they can be inherited. Whether you are tall or have red hair, you have these genes because they were transmitted from your parents to you. Even eye color can be defined by genetics. Depending on your parent’s eye color, how dominant that eye color is, and the variation of how other genes interact plays a huge role in what eye color you are born with. For example, a mother with green eyes and a father with light brown eyes can have a child with dark brown. This shows that eye color genes are established because of variations of genes. The child has dark brown eyes because of a dominant eye color, which is brown. The color of the eyes is different, however, because of the genetic combinations from parents. For instance, a mother with blue eyes and a father with blue eyes will have a baby with blue eyes; but it should be noted that the blue color of the child’s eyes won’t be exactly the same as their parents. The color will be slightly different because of different genetic variants. In regards to parents having children with a different eye color from them, that is a completely different story. While a parent with blue eyes and a parent with brown eyes can have a baby with a slight variation or different eye color than them, it is very rare for parents with the same eye color to have a child with a different eye color than them. 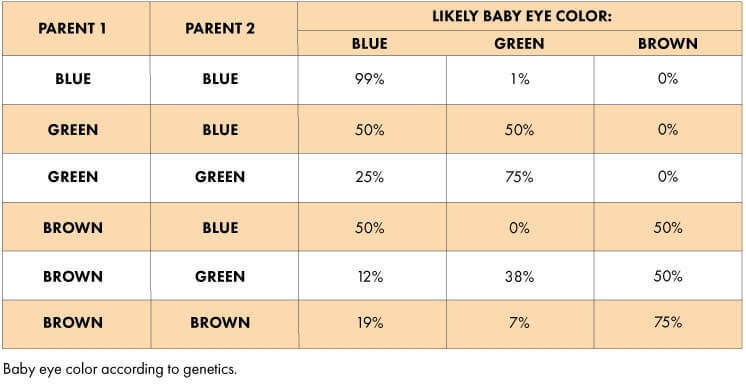 Parents that both have green eyes will most likely never have a child with brown eyes; they will either be blue or green, with a slight variation in color. By knowing your parent’s eye colors, it is easier to know why your eyes are the color that they are. Would you like more information about eye color genes or are you interested in relationship DNA testing? Call Face IT DNA Technology today at 833-322-3362. We are here to provide you with vital information and answer any questions that you might have.